I saw this picture and laughed so hard! It was one of those laughs that is so hard no noise comes out and I end up looking like an idiot clapping at nothing! 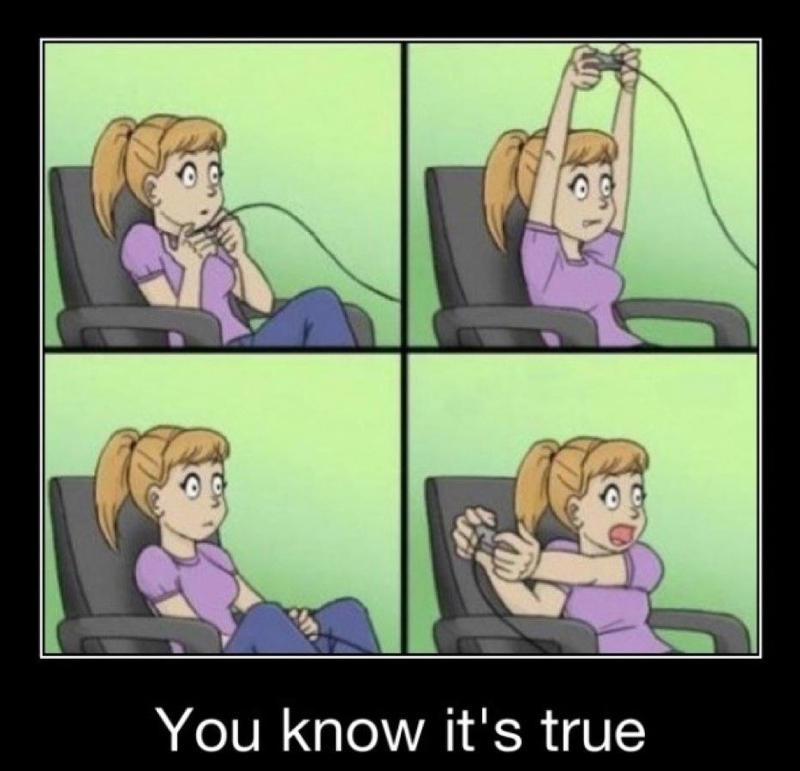 I don’t know how most women play these Xbox games…but me??? I am absolutely horrible! I remember my husband attempting to show me how to play the Halo game or whatever. Working those two turny knobby things was a disaster! One knob working the walking and one knob working the turning….come on now! I would run into walls and just keep walking into it! Yea, he found this kinda comical! The picture above is so freakin’ true too! I don’t know how to just hold that controller thing still in my lap! I get so excited and then find myself screaming at the t.v. while running for my life! I can’t help ducking behind the controller when I’m hiding from the bad guys either. I have tried and tried to remain calm….doesn’t work! The Halo game just kills me. I am the type that tries to find a lil’ “hidey hole” so I don’t die so quick. My husband likes to play the Halo game on the board that puts the two players against each other…which is retarded. I never last more than twenty seconds or so before he just blows me up! When playing the regular game, I panic when there are so many bad guys that I just hit all the buttons at the same time and hope for the best. Usually this ends in me throwing a grenade that takes out me, him and all the bad guys. Does it ever get any better? Now, the guitar games were a hoot too! I play backwards, for starters. I am right-handed so I guess that means I am supposed to strum the lil’ bar thing with my right hand…naw, not me! My right hand won’t do that! When we first started playing these games, I did the little kid level that only required me to hit the green button I think! LOL And trust me, that was difficult. I did get better though! I can play on the hard level now but my pinky don’t cooperate very much. So, I did improve greatly with the guitar games, but not the fighting games. Those fighting games…Mortal Kombat and such…don’t make any sense to me. I just hit every single button all at the same time! How do they expect people to remember all those combinations of moves? Every once in a while I hit so many buttons, my person does something really cool! And those “FINISH HIM” moves….LOL whatever! I never pull those off! My person just ends up punching the woozy guy and he falls over. I think my husband has all those moves memorized…somehow. I swear he studies those moves while I’m sleepin’ or something. It seems impossible to learn all the moves for one person, much less for all of them. That’s just insane! Anyway, just thought I’d share my adventures with the Xbox with you! I hope I’m not the only one that isn’t coordinated enough to play these games.